The Jams turn two this coming September! A program and event series that we started to help build the capability of our community of startups, founders and talent before they launch in offshore markets so that they are more ready to land. 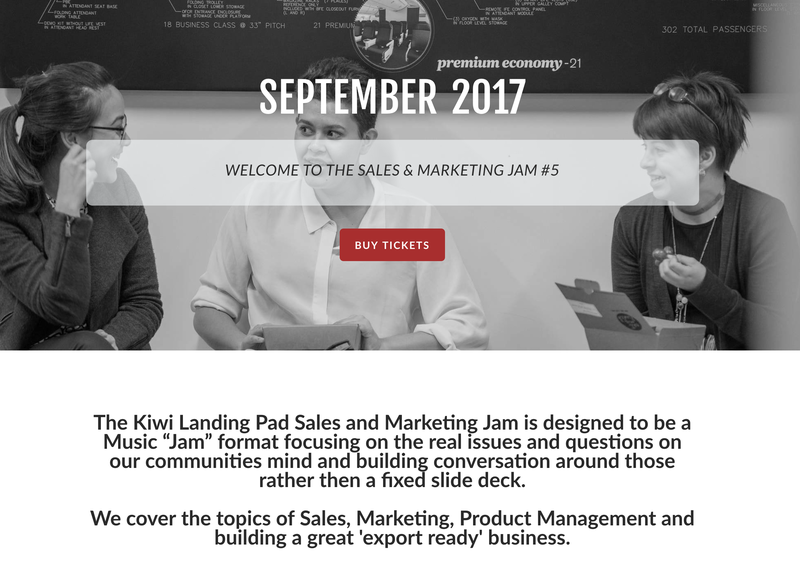 The Sales and Marketing Jams are back for round 5 on September 25th-29th, with three locations – Auckland, Wellington & Christchurch. We’ll be bringing three amazing speakers down from San Francisco from brands that you’ll most likely recognise, with a key focus on growth marketing, getting more leads, looking through the product lens and how to tell your story better as well as much more of a conversation centered around what you want to know to grow your business over the next 6 months. A key focus for us is helping our community grow great businesses regardless of where they end up exporting to. Join 1,150 other people and the 900 businesses who have attended a jam in the past. Excited to welcome new sponsors Spark, Xero and Interlike, as well as our core foundation sponsors continuing to support our mission to help support the success of the New Zealand business community – Air New Zealand, BNZ, NZTE, 90 Seconds and ChristchurchNZ. Get your tickets here, this is your formal invite. Kiwi Landing Pad won an award for our bilateral services deepening connection between New Zealand & the USA making it easier for Kiwi tech companies to export and land and expand into the US market. JOIN: the Kiwi Landing Pad community here. Xandra – A conversation design agency. Bringing more humanity to technology. Conversation design using AI and chatbots. Nudge – The first native content analytics platform, agencies & publishers track, measure & optimize their native content. Osnova – Osnova is creating an AI based private tutor for maths. We will democratise education and give everyone with internet access to free high quality education. Jude – Your private banker. Teknique – Teknique designs and engineers groundbreaking miniaturized video cameras that work wirelessly for security, driver safety, and action sports. Snapithd – Providing systems, hardware and AI for computer vision applications. Working in the maritime and construction industries. Swyft – Swyft is the disruptive turn-key automated retail channel for brands, retailers, franchise vend operators and enterprises to innovatively engage with users. The Kiwi Landing Pad team is currently in New Zealand for the next 2 months focusing on relaunching our brand and messaging, socialising the progress we have made in the last 3 years. We are very excited to launch the Sales & Marketing Jams for the 5th time, as well as continuing our weekly webinar series which is close to achieving the milestone of having 2000 attendees over an 18 month window and 32 webinars so far. As always, please let us know how we can help or what you need, we are just an email and answer away. Have a good end of month!